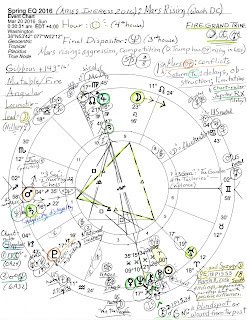 Image below: Horoscope of Spring Equinox (aka, Aries Ingress--Sun to Aries Point) March 20, 2016 Sunday 12:30:31 am EDT Washington DC; Hour of the Sun; chart-ruler Jupiter at Midheaven but retrograde; warrior Mars rising @4Sag35 and Saturn @16Sag22. Two malevolent planets in 1st house, plus, chart-ruler Jupiter Rx indicate potentials for: conflicts, aggression, delays, obstacles, and setbacks (ex: veterans' issues) during the Spring 2016 season; conditions may affect the entire year until next Spring unless and until other planetary factors intervene or mitigate the ones you see, below. The public mood is playfully Leonine as you see: Moon @23Leo16 in 9th house chugs along as lead planet in a Locomotive line-up of planets, plus, the Moon (Hillary?) is also a member of a Fire Grand Trine with status quo Saturn and progressive Uranus, a closed circuit of energies where 'she' (Luna) is privileged, insulated, and hopes to be protected from outside interference and frustration (though nervous tension is involved). In the creative Fire element, this pattern shows a Moon full of self-pride, personal significance, and egotism. Fire is the royal element which provides much inner strength and self-confidence (humility need not apply!) along with demands for recognition (and nomination!) though such demands may be expressed in subtle or indirect ways. A reserved or stilted manner may be noticed. Yet this leading Moon might also describe the SCOTUS nomination process with Jupiter and Saturn square (obstacles; blockages) and both societal planets relating to the legal system and to the much-touted 'checks and balances' between the three branches of the US government. Before the 2016 General Election in November, Donald Trump's Sun Gemini-Moon Sagittarius opposition will be visited by transit Mars, the activator, in September 2016 while transit Saturn will take his own time getting there beginning in late December 2016 though restrictive effects may be felt earlier. Saturn to natal Moon is a squelcher emotionally as is Saturn opposite natal Sun which tends to cause endless delays, missed goals, challenges to authority, and hurt pride. Promises not lived up to come back to haunt, vitality may be missing, and health can be somehow impaired especially if there are chronic conditions. Well, we haven't talked much about the recent Justice Antonin Scalia vacancy on The Bench (may he R.I.P.) but it's early days yet for that situation to gel though both sides are making noises. Suffice it to say that the Jupiter-Saturn square and Jupiter Rx already noted will provide plenty of delay tactics and blockages that we all expect to witness during the matinee performances of the Capitol Hill Political Theater that annoys We the People who are paying the tab for their half-hearted efforts as they 'govern' in breach of the public contract. One threat is another expensive Cruz 'filibuster' and unless someone stops him from again making a mockery of the US Senate, I wonder what he'll ham-ishly read this time?!? Testy Mars rising supplies plenty of conflict and tension. Now a quick mention must be made of wealthy manipulator Pluto @17Cap16 in the 2nd house of the National Treasury, an indicator of foreign banking interests directing our financial system through the Fed and centered in the City of London, last I heard. Here Pluto triggers the 1993 Great Conjunction/s of Age of Reason planets, enlightened Uranus and Neptune, as we've discussed many times before. Transit Pluto hitting their midpoint creates a picture of "the big picture which must be followed, very little option to do otherwise" (Tyl) which always reminds me of an 'offer that can't be refused' made famous as plutonian Underworld Crime Syndicate dialogue in films such as The Godfather. Yet it also hints at the centuries-long Great Plan to crash civilization so that a 'new world order' or 'global government' can be built upon ruins, a larger version of how they did us on 9/11/01. A draconian control grid is, in fact, in place already for the most part. Can you feel it? Pluto as sub-ruler of corporate Scorpio rules the 12th house of Politics, Karma, Self-Undoing, and secret Back Room Deals in the Spring Equinox chart. 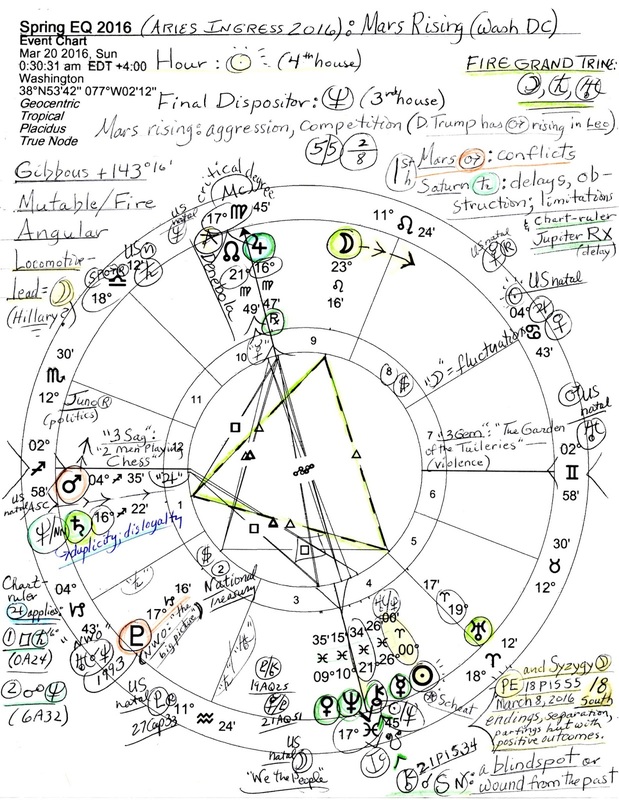 And yes, there is much more information to be found in the above chart but I can't type forever, so let's close with a few general notes concerning Spring Equinox 2016's fiery Sun Aries-Moon Leo blend if that's okay with you. Cautions are to watch out for those who exhibit a childish insistence on only seeing things their way (Ted Can Read!) or, those who move on to the next project before finishing the last (very Aries!) The emphasis is on such things as communications, support for causes, the concept or the actual demonstration of heroism, passionate idealism, inspired creativity, romance and entertainment. Now if "passionate idealism" doesn't remind you of Bernie Sanders, maybe the blend's "Image for Integration" will: "After slaying the black dragon of sloth and greed, the young warrior is knighted by the one true king. He marries the maiden of purity and they live happily ever after." (Sun Sign-Moon Sign, Charles and Suzi Harvey.) Nice how 'the maiden of purity' is Virgo the Virgin and Senator Sanders' natal Sun, North Node of Public Contact, and idealistic Neptune are all in Virgo at the Aspiration Point of the Spring Equinox 2016 horoscope. Massive (Jupiter) audiences (NN) have so far been his during his campaign! And last, on a curious note, one famous yet controversial person has turned up in the news during Campaign 2016 and perhaps she will again since she was born under the influences of the Sun Aries-Moon Leo blend. Her name? Feminist icon Gloria Steinem--with the Spring Equinox 2016 Moon spotlighting her Leo Midheaven!